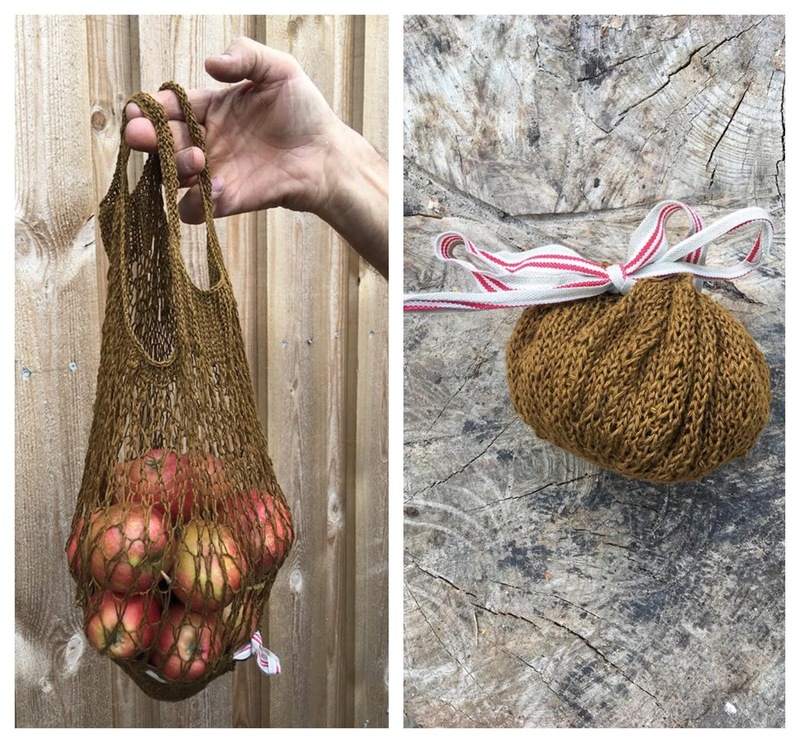 A handy little bag to replace the flimsy plastic bags offered for produce. 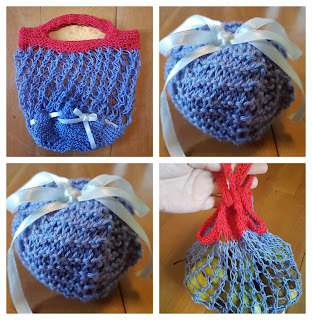 Folds into a little ball, making it easy to keep in your purse. The lace is open enough for cashiers for be able to see what is in your bag. You can make the bag bigger to transform it into a market bag, and make the ties longer turning them into handles. 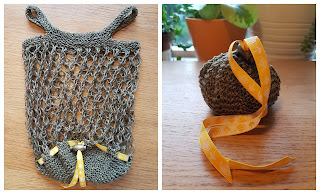 The bag can be made with almost any size yarn. Needles for bottom/pouch and ties: Double pointed needles in the size recommended for the yarn. Needles for the body of the bag: Circular needle 80 cm long (30") which is 4-5 sizes bigger than the size recommended for the yarn. 50 cm (20") ribbon, string, yarn, shoe laces, whatever you have on hand, for the closure. Increases: Any increase. Choose the one you like best. One of the simplest increases is kfb, where you knit ind the front and the back of the same stitch. Ridge: Garter, formed when you knit only, and knit forth and back. 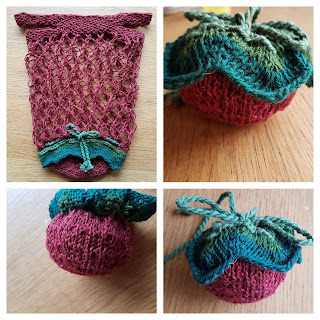 When you knit in the round, you knit one round and purl one round to achieve ridges. Variations: The bottom knitted in ridges. The bottom knitted in moss stitch. Ties knitted in moss stitch. Knit one row and distribute the stitches on double pointed needles. Continue to knit in the round. NB! Change into circular needle when the double pointed needles can no longer hold the stitches, or knit on circular needles from the beginning, using magic loop. Round 1: Increase in all stitches. Round 5.omg: *knit 1, increase 1 in next stitch* to the end of the round. Round 6.-8. o mg: Knit. Round 9. omg: *knit 2, increase 1 in next stitch* to the end of the round. Round 13. omg: *knit 3, increase 1 in next stitch* to the end of the round. Round 17.omg: *knit 4, increase 1 in next stitch* to the end of the round. Round 21. omg: *knit 5, increase 1 in next stitch* to the end of the round. Round 25. omg: *knit 6, increase 1 in next stitch* to the end of the round. Round 29. omg: *knit 7, increase 1 in next stitch* to the end of the round. (You can continue this way, if you want the bag to become larger). Round 2: *knit 4, yarn over, k2tog* to the end of the round. Round 1: k2tog to the end of the round. Round 3: *2 yarn over, k2tog* to the end of the round. 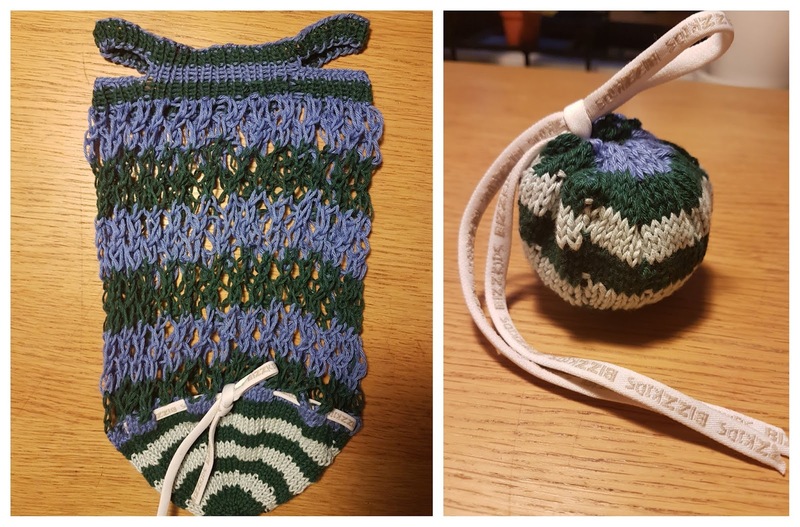 (Important: You wrap the yarn around the needle twice, not once as with a regular yarnover). Round 4. 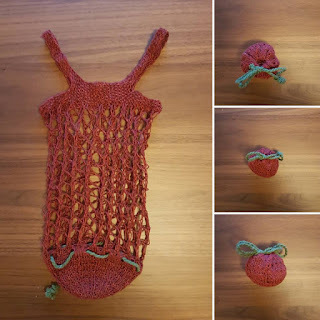 *Knit 1 in the first wrap of the yarnover, let the second wrap fall of the needle, knit 1* to the end of the round. Repeat round 3 and 4 for at total of 12 times or until the bag has the desired size. In ridges (or any stitch pattern which doesn't roll). Round 1: Increase in all stitches to the end of the round. Count how many stitches you have. Divide by four. Bind of 1/4 of the stitches. Knit 1/4 of the stitches. Knit the last 1/4 of the stitches. purl the 1/4 of the stitches you didn't bind off. Use the cast on tail to weave around the hole at the bottom and pull thigh. Fastn. It is not nessessary to press the bag, but I recommend to stretch it with your hands in all directions to distribute the stitches evenly. Pull a string through the eyelets. Put the top of the bag into the bottom/pouch. Pull the string tight and tie. You can also use a spring toggle.